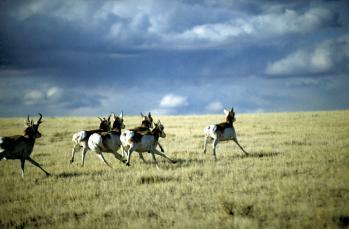 Pronghorns Antilocapra americana photographed by Courtney Milne. Contains: Giraffoidea, Bovidae, Cervidae, Palaeomerycidae. The Pecora are the clade containing most modern ruminants except for the chevrotains. Relationships within the Pecora have long been debated, but most recent studies support a monophyletic grouping of Bovidae, Moschidae and Cervidae, with Giraffidae and Antilocapra outside this clade. The centre of modern diversity for the Pecora is the Old World; the pronghorn Antilocapra americana is, however, native to North America (as are some species of Bovidae and Cervidae). Horns or other horn-like cranial appendages are characteristic of most living families of pecorans; however, the musk deer Moschus of central Asia lack horns and males instead have prominent enlarged canines. Synapomorphies (from Janis & Scott 1988): Compact, parallel-sided astragalus; stapedial artery absent; enlarged fossa for stapedial muscle on petrosal; subarcuate fossa reduced; broadened basioccipital with strong flexion stops on condyles; laterally enclosed postglenoid foramen; fore- and hindlimbs almost equal in length; four-chambered stomach with omasum. [BLB05] Boisserie, J.-R., F. Lihoreau & M. Brunet. 2005. The position of Hippopotamidae within Cetartiodactyla. Proceedings of the National Academy of Sciences of the USA 102 (5): 1537–1541. [C77] Cope, E. D. 1877. Report upon the extinct Vertebrata obtained in New Mexico by parties of the expedition of 1874. Geographical Surveys West of the One Hundredth Meridian 4(2): i–iv, 1–370. [G78a] Gentry, A. W. 1978a. Tragulidae and Camelidae. In: Maglio, V. J., & H. B. S. Cooke (eds) Evolution of African Mammals pp. 536–539. Harvard University Press: Cambridge (Massachusetts). [G78b] Gentry, A. W. 1978b. Bovidae. In: Maglio, V. J., & H. B. S. Cooke (eds) Evolution of African Mammals pp. 540–572. Harvard University Press: Cambridge (Massachusetts). [H78] Hamilton, W. R. 1978. Cervidae and Palaeomerycidae. In: Maglio, V. J., & H. B. S. Cooke (eds) Evolution of African Mammals pp. 496–508. Harvard University Press: Cambridge (Massachusetts). [HD03] Hassanin, A., & E. J. P. Douzery. 2003. Molecular and morphological phylogenies of Ruminantia and the alternative position of the Moschidae. Systematic Biology 52 (2): 206–228. [JS88] Janis, C. M., & K. M. Scott. 1988. The phylogeny of the Ruminantia (Artiodactyla, Mammalia). In: Benton, M. J. (ed.) The Phylogeny and Classification of the Tetrapods vol. 2. Mammals pp. 273–282. Clarendon Press: Oxford. [K84] Kitchen, D. W. 1984. Pronghorn. In: Macdonald, D. (ed.) All the World’s Animals: Hoofed Mammals pp. 102–103. Torstar Books: New York. [SOG09] Spaulding, M., M. A. O'Leary & J. Gatesy. 2009. Relationships of Cetacea (Artiodactyla) among mammals: increased taxon sampling alters interpretation of key fossils and character evolution. PLoS One 4 (9): e7062.